Today on International Women’s Day, we usually celebrate women’s achievements, highlight their successes and shine a light on their empowerment. But today is not a normal day. It has been 17 days since our team, consisting of over 60 women, along with all civilians in Eastern Ghouta have been forced underground. They are living in damp, dark and ill-equipped bunkers that have no kitchens or bathrooms. They are also unable to eat, as there is no food reaching the area. Last night was the worst night since the assault on Ghouta began. Our team is reporting that it was “a catastrophic night under chlorine gas and cluster bombs”. Adding to this, the recent aid convoy had been stripped of 70% of its medical aid supplies and was also unable to finish its distribution . This is one of the most dire developments of the humanitarian situation in Eastern Ghouta. Under these circumstances, women are calling for an immediate end to the bloodshed, for the weapons to fall silent, aid to be allowed to enter the area and the siege to be lifted. Above all, the protection of civilians in accordance with international humanitarian law must be guaranteed. On this day on which we celebrate women’s achievements, we should not forget those who have been forced into darkness. And even from these dark cellars and bunkers, messages reach us daily, updating us about the situation, and showing women’ strength and leadership. We have been publishing the stories and providing a platform for these women to share their fears, thoughts and hopes. The situation all over the country is dramatic and civilians are under threat in many areas. 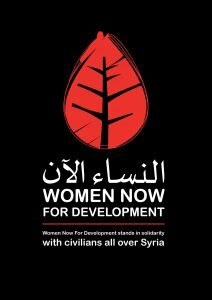 Desperate pleas reach us from women all over the country, fearing for their lives and their families’ futures. We stand in solidarity with all civilians in Syria. On this day, please take action and raise awareness about the situation in Eastern Ghouta and the rest of Syria. We can no longer afford to be silent in the face of such atrocities! 3) Donate to support Syrian women and girls in Syria and help us continue our work.